Candy hearts and paper valentines are a thing of the past. This year, give your Valentine something your romantic-self will be proud of and your bank account will appreciate. Try any of these $50 and under gift ideas, and your Valentine will love your thoughtfulness while appreciating your practicality. Shopping for a jewelry lover? Try the Togetherness necklace by Lisa Leonard designs at Lisa Leonard Designs. A personalized charm necklace designed to celebrate love and togetherness, in a timeless design, is perfect for a sentimental jewelry lover. Do you love a creative foodie? Try the Valentine’s Day Berries by Edible Arrangements. 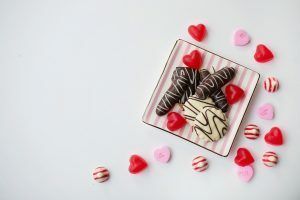 A fun way to enjoy chocolate, these dipped strawberries come designed with multiple types of chocolate and a custom box. Does your Valentine love good skin care? Give them the gift of a Rodan and Fields Consultant! Rodan and Fields has options for different budgets, so start by gifting her a body lotion or sunless tanner! When it comes to love, nothing beats quality time. Find a night, preferably February 14, to take your Valentine out for a wonderful meal. While an evening out for Valentine’s Day is not a new idea, try spicing it up with a bit of fun! Turn your romantic date night into a scavenger hunt down memory lane. Put your date in the passenger seat and give them a “clue” about a location special to your relationship. At each location, have a small but personal gift. Want bonus points? Include a short love note with each gift. This is a fun way to get creative while enjoying a romantic date, just make sure to plan enough time. Want to keep things light-hearted this Valentine’s Day? Try the bowling alley and 40 single dollar bills. Enjoy a game or two of bowling, but make it competitive by placing small wagers on each frame, minimum $1. Each person has $20 to play and can wager as much as they’d like on an individual frame. The highest score each frame wins the money! It is certainly possible to make Valentine’s Day special without breaking the bank. However, if you need a little help to make one of these gifts happen, try taking out a small personal loan or holiday loans that can be repaid quickly with affordable payments. Ask any questions to help get your Valentine’s started!